Whereas electromagnetic compatibility (EMC) testing and certification may have previously been regarded by manufacturers of electrical and electronic devices as a necessary evil, it can actually help them to gain a competitive edge. How? Read on to find out. No product is an island. During use, electrically or battery powered equipment generate electromagnetic fields. The consequence can be electromagnetic interference, a common issue when devices operate near each other. With the increased complexity of nowadays' technology, identifying all the possible sources of interference, either by or to a product, is not exactly piece of cake. EMC testing is often seen as a time-to-market nemesis. Let's change your mind about that, shall we? Around a century ago, when the US Navy introduced wireless telegraphy to transmit information via radio waves, all transmitters were tuned to the same frequency. Interference reigned whenever multiple transmitters were operated at once – making communication impossible and posing a risk to the country’s military service. In response to EMChaos, the first EMC regulation was issued in the early 20th century, assigning different frequencies to different types of radio users and – combined with technological advancements – paving the way for radio communication and broadcasting to flourish. Since then, the EMC regulations, test procedures, and standards have been repeatedly reviewed and extended to keep pace with the latest developments in technology. Simply put, all electrically and battery powered devices must comply with the EMC Directive 2014/30/EU – unless they have radiofrequency (RF) communication, in which case EMC testing is covered by the Radio Equipment Directive (RED) 2014/53/EU. The RED aims to ensure, among other essential requirements, that electronic or electrical equipment with RF communication shall work as intended in its environment and not generate electromagnetic disturbances, which may influence other equipment. The RED is particularly relevant when considering the adoption of smart technologies, as failures in connectivity are perceived as an unacceptable nuisance by consumers and are still one of the biggest obstacles for the popularization of the Internet of Things. Now think of a smart home: while everything is supposed to connect and work together, the higher the density of devices in an ecosystem, the higher the chances of interference. Rather than hurdling R&D folk, EMC testing offers manufacturers of electronic or electrical equipment a way of solving this ‘first-world problem’. The amount of electromagnetic noise a product generates, and its susceptibility to interference by other devices, is affected by numerous factors: the battery inside the product or the printed circuit board, antennas, power cords and cables, high frequency signals from radio frequency circuits or high speed memory buses, LCD displays, and so on. Manufacturers frequently treat mechanical enclosure design, LCD selection, and printed circuit board design activities as independent efforts. However, in order to develop a consumer product (and this applies not only to ‘smart’ products) from a true electromagnetic perspective, engineers need to ensure that all these things ultimately work together as a complete electromagnetic noise containment system. This requires greater attention to layout, device density, antenna placements, shielding, isolation and filtering, in addition to the functional design of the product. This is a growing challenge for engineers, especially as the miniaturization trend continues and consumer devices are becoming more compact. 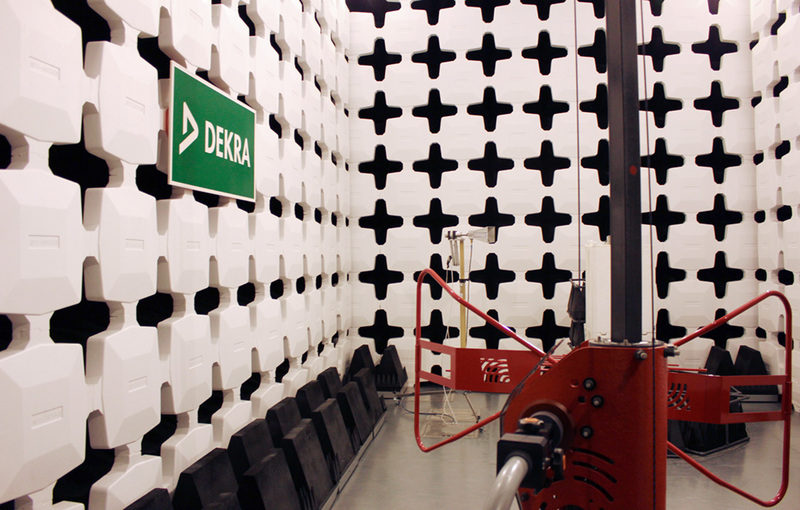 To ensure interference-free operation, it is important to involve EMC testing early on in the design and development phase. With years of experience, we can help you do that in our global network of labs. We work in a flexible way, taking your requirements and processes into account. Perhaps surprisingly, many people believe EMC is not related to safety. However, it is very so. The EMC Directive requires equipment not to exceed the levels above which radio and telecommunications equipment and other equipment cannot operate as intended. It also requires a level of immunity to the electromagnetic disturbances expected in its intended use which allows the equipment to operate without unacceptable degradation of its intended use. This is closely linked with product safety. After all, as the IoT expands and more and more products are interconnected, interference from or with another device leading to performance failure, increase in the noise floor, and disruption to or failure of transmission and signal integrity can have potentially serious consequences for both human safety and network protection (e.g. data security and cyber security). At DEKRA we can help manufacturers to take an integral approach to EMC, to ensure that the new consumer device will be IoT compatible, while also complying with the relevant legal and safety requirements in export markets around the world. Therefore, EMC compliance enables manufacturers to improve the consistency and reliability of smart systems and to protect their professional reputation at the same time. Furthermore, by involving us from a very early stage in the design and development process, manufacturers can gain a competitive edge thanks to fewer adaptation loops, saving them valuable time and money. One of the most important drivers in the adoption of the IoT is the availability of a radio frequency spectrum. Regulators are increasingly making frequency bands available for wireless data communications usage. However, the already crowded spectrum will become even more clogged as users demand higher quality service and instant connectivity for applications ranging from Voice over IP (VoIP) communication to video streaming. EMC plays a key role in innovative new technologies to solve this problem, such as ‘spectrum sharing’ tools. These enable the wireless devices to be actively managed from central control systems, effectively turning IoT devices on or off depending on other user priorities. Another exciting area in the wireless industry includes the expansion of communications into the mmWave region and the growing implementation of very-high-frequency (60+GHz) radio links that allow for extremely high throughput and data rates. Needless to say, such developments will mean that EMC testing and measurement standards will continue to evolve as well. For more information or advice, feel free to contact us at any time.